With forecast conditions looking rather gloomy for observers watching at the Tribute in Light but rosy for avoiding any potential for hazardous conditions for migrating birds, [Cornell Lab of Ornithology's] Team BirdCast predicted local, light movements and perhaps tens of birds in the beams of light during the memorial during the night of 11-12 September 2013. The first migrating bird appeared in the beam at 8:11pm EDT, with a scattering of birds thereafter for the first two hours after sunset. Then something changed, and what seemed like a reasonably good prediction playing itself out started to look as if it missed the mark slightly before missing the board completely! Between 10:30-11 pm EDT numbers of birds in the beam began to grow, and suddenly the forecast for tens of birds in the beams was off by two orders of magnitude! Team BirdCast likes to be the first to point out its forecasting missteps, so here is some interpretation of where things went wrong in the forecast! A substantial line of thunderstorms from central southern Pennsylvania to central and eastern New York and western New England slowly was drifting North and East across the region, winds were primarily southerly and southwesterly, and the warm and moist air mass presiding over the region felt more like summer than fall. What we did not consider was the presence of a gust front, visible in the movie above in the first few frames; watch for a thin gray line stretching from eastern Pennsylvania North and East into eastern Massachusetts and slowly moving Southeast toward the coast. As this gust front moves Southeast, a noticeable change in targets aloft occurs, particularly along the Connecticut coast. These targets are birds taking flight, reaching moderate levels along the immediate coast, and quickly eclipsing the forecast densities! It seems that as the gust front passed, conditions changed sufficiently to cue birds to fly, albeit a couple of hours after typical post-sunset exodus. Gust fronts are also known as outflow boundaries, separating cool air flowing out of thunderstorms from the surrounding air mass. In this case the gust front had some effects similar to those of a passing cold front, with a slight wind shift and presumably a slight dip in temperature and increase in pressure. Numbers of birds, appearing as light to moderate movements along a corridor from New Jersey North and East to eastern Massachusetts in the movie, clearly interpreted these changes as signifying the time to take flight. While numbers of birds increased in these areas in the hours after the passage of the gust front, most of the remainder of the region, particularly to the West of the line of storms, saw whatever light and scattered movements diminish. After the initial scattering of birds in the early hours of the evening, the arrival of hundreds and then thousands of migrants in the beams that had taken off with the passage of the gust front was a surprise to say the least. Here is a short clip of the nocturnal migrant activity in the beam at approximately 2 AM EDT 12 September 2013. Almost all of the white “snowflake”-like objects in this video are warblers, flying around the beams from 100-1,500 m above the ground. Special thanks to the Municipal Arts Society for allowing NYC Audubon and the Cornell Lab of Ornithology to monitor at the Tribute in Light. Moreover, Team BirdCast would also like to acknowledge that, as in past years when numerous birds were attracted to the beams, the organizers of the Tribute turned off the beams on four separate occasions during the night to avoid potentially hazardous situations for birds attracted to the lights! More than 500 students and expert scientists from around the world descended on Central Park last Monday, August 26. Their goal: to identify as many living things as possible in 24 hours, to gauge the diversity of the Park’s plants and wildlife. 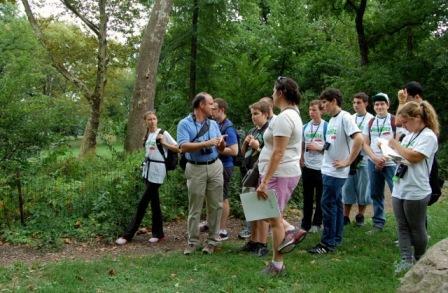 The first such study of the Park in a decade, this year’s Central Park Bioblitz was coordinated by Macaulay Honors College at CUNY and the Central Park Conservancy with the help of experts from all over the globe. Students and researchers broke into teams and fanned out over the Park’s 843 acres to identify arthropods, lichens, plants, reptiles, fish, birds, bats, and more. NYC Audubon supplied the bird buffs, including Executive Director Glenn Phillips, Board President Harry Maas, and interns Darren Klein and myself (although I got to help with the bats, too). We also had the gracious help of volunteers Bruce Yolton, James Buckler, Richard Lieberman, and Phil Cusimano. Between all of us, we took over 40 students out to survey birds, focusing on the North Woods and the Ramble for highest diversity. The forecasted major thunderstorms held off, and despite the drizzly weather, we saw a great array of species. The students were excitedly documenting the plants, chipmunks, and butterflies they saw while on the lookout for birds. One group that went out Monday afternoon spotted a Wilson’s warbler among the blue jays and starlings, and the Tuesday morning groups listed a blue-gray gnatcatcher and a black-and-white warbler among their findings. Even the bat team got to document a bird species when we accidentally caught a northern waterthrush in our mist net. Of course, he was safely removed and sent on his way. Along with the census, experts took the opportunity to engage the students in discussions about bird biology, conservation, and the importance of the biodiversity that can be found right in our own backyards. It was an opportunity for college students of all majors and interests to get some hands- on experience in biology, and not the kind that happens in a lab. One highlight: Students who at first could only recognize pigeons were able to point out American redstarts by the end of their session. That just can’t be taught in a classroom. But the students aren’t the only winners here; the Park will benefit, too. Once all the data from the BioBlitz are compiled, it will be compared to the first Central Park BioBlitz, held in 2003. The Central Park Conservancy plans to analyze how Park wildlife has fared this last decade, and use their findings to inform management practices. Keep a lookout for the final tally and species list, expected this fall.